Attention, it noted, then turned to global issues of shared interest, such as the protection of the environment, migration, and multilateral commitment to conflict prevention and resolution, especially in relation to disarmament. 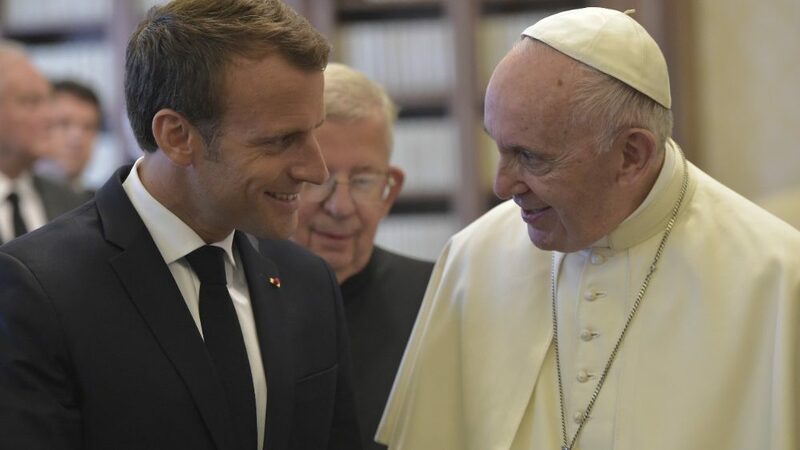 After meeting with the Pope, the French president met with Vatican Secretary of State Cardinal Pietro Parolin and Secretary for Relations with States, Archbishop Paul Gallagher. Here is a translation of the telegram that the Holy Father had sent to Macron when he had just been elected president. On the occasion of your investiture as President of the French Republic, I express to you my very cordial wishes for the exercise of your high functions at the service of all your compatriots. I pray God to sustain you so that your country, in fidelity to the rich diversity of its moral traditions and of its spiritual heritage, marked also by the Christian tradition, may bear always the concern for the building of a more just and fraternal society. In respect of differences and care to persons in situations of precariousness and exclusion, may it contribute to cooperation and solidarity among the nations. May France continue to foster, in the heart of Europe and in the world, the quest for peace and the common good, respect for life as well as the defense of the dignity of each person and of all peoples. I invoke from the depth of my heart, upon your person and upon all the inhabitants of France, the Lord’s blessing.